The Dingo Fence or Dog Fence is a pest-exclusion fence that was built in Australia during the 1880s and finished in 1885, to keep dingoes out of the relatively fertile south-east part of the continent and protect the sheep flocks of southern Queensland. It is one of the longest structures in the world ; It stretches 5,614 kilometres (3,488 mi) from Jimbour on the Darling Downs near Dalby through thousands of kilometres of arid land ending west of Eyre peninsula on cliffs of the Nullarbor Plain above the Great Australian Bight near Nundroo. It has been partly successful, though dingoes can still be found in parts of the southern states. Although the fence has helped reduce losses of sheep to predators, this has been countered by holes in fences found in the 1990s through which dingo offspring have passed and by increased pasture competition from rabbits and kangaroos. 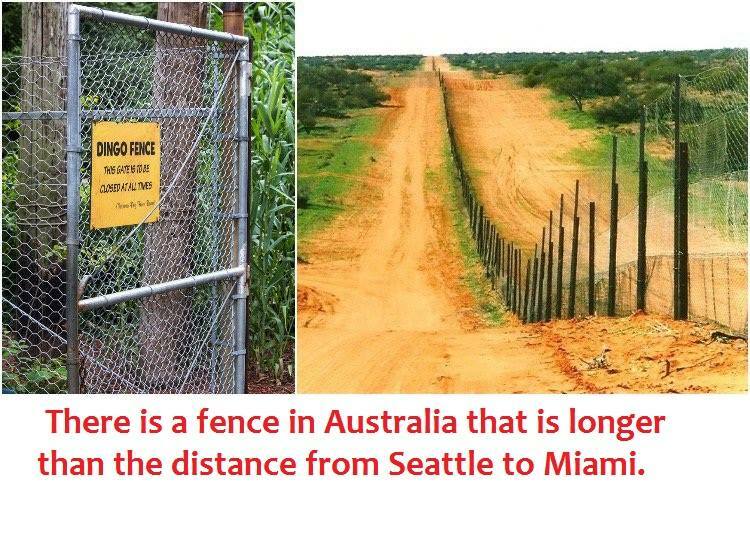 The Dingo Fence in Australia stretches across 5,614 kilometers. It has earned the reputation of being the longest fence in the world. The work to build the fence started in the 1880s and completed in 1885. The objective was to keep dingoes out of the fertile southeast part of the continent. The fence stretches from eastern Queensland all the way to the South Australian coastline. In the 1860s and 1870s, exclusion fences came to be erected across Australia to keep marsupials out of the croplands. Then came rabbit-proof fences in 1884 followed by dingo-proof fences. In 1930, an estimated 32,000 km of dog netting was being used on top of the rabbit fences, and that too in Queensland alone. The earliest pest exclusion fences in Australia were created to protect small plots of cropland from the predation by marsupials. In the 1860s and 1870s, introduced rabbit populations began to spread rapidly across southern Australia. By 1884, a rabbit-proof fence was built. Having been unsuccessful at keeping rabbits out, and more successful at keeping out pigs, kangaroos, emus and brumbies, and as more sheep farms were established, the interest for a dingo-proof barrier increased enough that government funds were being used to heighten and expand the fence. In 1930, an estimated 32,000 km of dog netting in Queensland alone was being used on top of rabbit fences. Prior to 1948, the idea of a Dingo Barrier Fence Scheme had not come into fruition as a statewide project for which annual maintenance and repair were kept. Since this time, there have been pushes to move away from a method of barrier-exclusion to complete extinction of the dingo and wild-dog cross-breeds. Poisoning the species with compound 1080 (sodium monofluoroacetate) baits has been seen as a much cheaper alternative than fence maintenance. A compromise in the form of the continued use of poison and the shortening of the fence from its previous length of over 8000 km has been made. It seems that there are fewer kangaroos and emus on the northwestern side of the fence where the dingoes are, suggesting that the dingoes’ presence reduces the populations of those animals. It has also been suggested that the larger kangaroo populations inside the fence have been caused by the lack of dingo predation, and competition for food leads to lower sheep stocking rates than would be possible without the fence. Believed to have been introduced into Australia by Aboriginals between 4,600 and 18,300 years ago, the dingo’s status as a native or introduced species in Australia has been a controversy. According to Dr. Mike Letnic, at the Centre for Ecosystem Science, UNSW, the dingo, as Australia’s top predator, has an important role in maintaining the balance of nature and that reintroduced or existing dingo populations could increase biodiversity across more than 2 million square kilometres of Australia (Avolia 2009). Where dingoes had been exterminated, Dr. Letnic found increased abundances of introduced red foxes and herbivores, while small native mammals and grasses were lost. In 2011 the Liberal MP for Stuart, Dan van Holst Pellekaan, called for a $200 bounty on dingos. Although the fence has helped reduce the loss of sheep to predators, the exclusion of dingoes has allowed for increased pasture competition from rabbits, kangaroos and emus. Sheep are being lost to increasing numbers of feral dogs.